"Elijah learned to find God's will and to pray it until it appeared." Forgiveness is more than a work to do… It is the power to change the world! Altogether Forgiven takes us into a world that too few believers ever discover. “Forgiveness is a work, yes. But it is not a work in the sheer grit of determination to forgive. To forgive is this alone: Seeking God until you come to intimate fellowship with His heart about the issue and the person. “Forgiveness is a choice, yes. But after the will to forgive, it is not a mental matter. As the scriptures make clear, forgive…“from your heart.” When you are hurt, the pain goes to your heart first, then your mind. Altogether Forgiven was first introduced to readers in 2001 as a series of articles published on Shulamite.com, the original website for Shulamite Ministries. After 32 articles that she knew would become a book one day, the Holy Spirit led Martha in a different direction. Sixteen years later, the Holy Spirit gave Martha a new anointing for the subject of forgiveness and a deeper revelation of its power and importance. His timing is impeccable as always, and the world is in great need of a fresh lesson in forgiving and living forgiven. Are you ready for the spiritual adventure of living forgiven? Do you seek the peace that salvation promises? Have you grown desperate for answered prayer? Do you long to see Christ? Then you need to read this book! With Altogether Forgiven, Martha greatly expands the accepted boundaries for the world of forgiveness. The spiritual impact of forgiveness and the practical results that follow are bigger and further reaching than most of us can even imagine. If your world is in need of change, forgiveness is the power that can and will change it. May each heart hungry for wisdom and HOPE find this beautiful book and be fed! 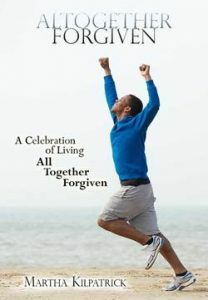 Altogether Forgiven is available at Living Christian Books, as well on Kindle! We are all on a lifelong journey and the core of its challenge, the terrible demand of its centrality is forgiving and being forgiven. By that rocky and formidable climb – the sweat of forgiveness – we can peak the mountain of human suffering and gaze down on the meaning of our own history. For every believer, wrongs are a life-long challenge. There is no harder work in life than to forgive. It is a Labor so hard that few will work the work, which is to say, “Die the death.” Only by our own forgiveness will we comprehend the Ghastly Cross and our Bloody Savior’s gift of innocence. Innocence quite beyond forgiveness. Given to me, to all. I am a shameful expert in bitterness. I am all too familiar with its dark paths and soul-traps. I know the ruts it carves in your mind that your thoughts find so easily, so habitually. I am also acquainted with the alienation from God that is the reward of unforgiveness. Bitterness has been my torment and, in the end, my crucible of spiritual freedom. It brought me to beg the Lord to make me more an expert on forgiveness than bitterness. I know that my own story, when it’s finished, is going to be only about God’s grace and forgiveness, not my achievement or any honors. One measure of a life’s spiritual success will – in the end of all – be the size of genuine forgiveness. So I asked the Lord for rich secrets of forgiveness. And I discovered the one secret that is the key to all—to forgiving and being forgiven. That secret is love. Come with me, beloved of God, come with me to behold with new eyes, the miracle of the universe – forgiveness. And forgive us our debts, as we have forgiven our debtors [letting go of both the wrong and the resentment]. The Lord’s Prayer is sequential, and the 1-2-3 order is unmistakable. It is a list of the Father’s priorities and gifts, all conditional upon this one crux: forgiving others. Even after the amen, this crucial condition – without which you cannot claim protection from temptation nor deliverance from evil – is emphasized again. To be sure we understand that forgiveness is a life or death spiritual matter, the Lord Jesus repeats this one command, a clear and unmistakable requirement for our own desperate need of forgiveness: We must forgive or lose ourselves and God. Such a price Jesus paid for your forgiveness! So great a gift the Father gave, His beloved Son. For God so [greatly] loved and dearly prized the world, that He [even] gave His one and only begotten Son. You and I were saved by a Love so vast, so selfless…and it rightfully demands of us a reception of that Love and a surrender to this gift of Love! Such a small cost, to forgive others, given the consequence. God paid a high price to save you to Himself. If you can grasp it, you will see the treasure you are in His eyes, as well as the costly gift of forgiveness. The price for your freedom from sin and Satan was something more valuable than all the wealth on earth. For you know that you were not redeemed from your useless [spiritually unproductive] way of life inherited [by tradition] from your forefathers with perishable things like silver and gold, but [you were actually purchased] with precious blood, like that of a [sacrificial] lamb unblemished and spotless, the priceless blood of Christ. God sees you through the Blood of Christ and that blood satisfied God’s standard and God’s principles. And He is satisfied in you by the blood of His only begotten Son, Jesus. The blood was shed for you. The blood of Christ washes us from the inside. We ‘drink’ it by faith, without the need to comprehend the big HOW. In mystery, the Holy Spirit enters us and applies the blood of Christ to the innermost place of the conscience, and there the blood washes away sin’s darkness from the very core of my being! And guilt is gone for Ever. All things are cleansed with blood, and without shedding of blood there is no forgiveness. Many ask for forgiveness with no consciousness of the Blood as the solution and only source of being forgiven. Never can we separate God’s forgiveness from the Blood of Christ. Nor can we forget the Man who gave it. The world would have a bloodless forgiveness based only on God’s goodness, and so eliminate the very origin of mercy. A bloodless forgiveness does not exist. Jesus’ cup is the New Covenant in His blood, and when receiving His blood, we remember Him Who gave of that cleansing fountain! Simply, as you drink the blood, ‘Remember Me.’ He asks just that of those who drink His blood. May we faithfully remember and treasure that sacred red stream that poured out on the earth from His shredded body and took away the sins of the world. In the same way He took the cup also after supper, saying,“This cup is the new covenant in My blood; do this, as often as you drink it, in remembrance of Me. In my earliest walk with the Lord, I found 1 John 1:9 and I was astonished. I had never heard that we could be cleansed from sin; I expected only forgiveness. The verse said that as I confessed a sin, at that moment I was cleansed from that very sin. I was elated like a child! “Cleanse us from ALL unrighteousness!” Oh joy, I would run to confess all my sins. So simple and so perfect! I fully believed I was being cleansed of ‘ALL unrighteousness’ because the Bible said so. And it would be true. Besetting sins began to just…be gone. I would learn later that the cleansing I so treasured was actually from the Blood of Christ. At the time I could barely believe that it was so easy to be forgiven and cleansed from all sin. That was completely amazing to me! I never dreaded seeing my many sins, because I had the perfect cure in Jesus’ Blood. And those verses – 1 John 1:7-9 – became a ‘prescription’ I have given many times as a total solution to guilt. That word was, and still is, my constant cure and God’s faithful healing. For they did not continue in my covenant, and so I showed no concern for them, declares the Lord. Jesus paid for sin, and also He took sin away. But He went even beyond the issue of sin, to establish a new contract between humanity and God. It was a promise contract, and He guaranteed the promise with His own blood. Forgiveness is…accepting God’s sovereign use of people and situations to strip you of self-importance and humiliate your self-love. Forgiveness is…faith in God’s Controlling Permission and All-knowing Goodness pouring out toward tiny you. Forgiveness is…hope that you will meet only Divine Mercy for yourself. Forgiveness is…love for the Great Forgiver and simple obedience for His sake. Forgiving is…letting God be God! And doing whatever He likes — or doesn’t. Forgiveness is not…a cowardly tolerance of evil. Forgiveness is not…being “good” because that is the command. Forgiveness is not…excusing the wrong by pity. Forgiveness is not…explaining why, for there is never an explanation. Forgiveness is not…swallowing the pain and lying to yourself about its existence. Such false forgiveness becomes blind-bitterness…buried and festering in deep unconscious sickness of soul. It is dangerous because it becomes a contagious disease, hidden under the blankets of self-satisfaction – evil, ever spreading through words and deeds that cover and hide it. Unforgiveness: unacknowledged, unconfessed, deadly to you and highly dangerous to others. You have an enemy of your destiny. In fact, this is your worst enemy, one who is totally against you, often corrupts you, and gets you constantly into trouble. This enemy fails you, hates God, and cares only about itself. It compels you to do what you don’t want to do, and drags you where you wish you hadn’t gone. It is the most dangerous of all your enemies and the hardest to forgive. Look in the mirror and you will see your worst enemy. Have you ever tried to forgive YOU? Oh, you have so many offenses with what you have done! That forgiveness is a mountain hidden in your soul. In fact, this is usually that last person you will think of as an enemy to forgive. We have done what can’t be undone and the regret is life long. For what I am doing, I do not understand; for I am not practicing what I would like to do, but I am doing the very thing I hate. So now, no longer am I the one doing it, but sin which dwells in me. Paul experienced this and cried out in his helplessness. He had an alive conscience that knew God’s law and ways, but he had no power to stop failing, and no solution. This is the inevitable experience of a true believer. We come to the futility of our efforts, the failure of our character, and it is excruciating. The man was in that terrible struggle within, the flesh warring against the spirit. Paul’s answer and liberty was Christ. The truth we learn is that we died with Christ, and our new life was resurrected with Him. Or are you unaware that all of us who were baptized into Christ Jesus were baptized into His death? Therefore, we were buried with Him by baptism into death, in order that, just as Christ was raised from the dead by the glory of the Father, so we too may walk in a new way of life. There is overwhelming grace when you forgive yourself. For some, this is the last forgiveness and perhaps the most powerful to give you freedom from guilt and self-hatred. And my eyes were opened to a great liberty. It became so clear that the other party was completely responsible, not me. I cannot be forgiven for what I did not do! My peace came only when I gave up my false guilt and recognized the true guilt of the offender. People blame. Even believers dump their guilt wherever they can. Blame is inherent in humanity, from the Garden. The man blamed the woman, the woman blamed the serpent. All forgiveness requires God’s help to sort out real guilt and false guilt. And it is a joyful and blessed assignment, because no matter the human mess, you can experience the cleansing of your heart before God. The Spirit shares God’s reality, and either way, you forgive or you are forgiven. For You, Lord, are good and ready to forgive, And abundant in lovingkindness to all who call upon You.